If you want to have to explore the scenic beauties of three different cities Delhi, Agra and Jaipur in at one time, availing our Golden Triangle Tour packages would be apt. 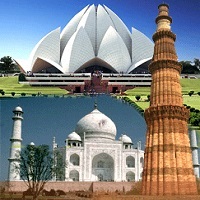 We at, Shreejay Tours And Travels offer striking deals on Golden Triangle Tours at the very economical rates. We inculcate all your requirements in the formulation of our tour packages. So if you are a fond of Delhis fashion apparels, Agras cuisines and Jaipurs handicrafts, then availing our Golden Triangle Tour packages would be apt in this regard.